Global Pop Star Rita Ora is Coming to Manila! Let's tear up the town, 'cause that's how we do! Right, Rita? 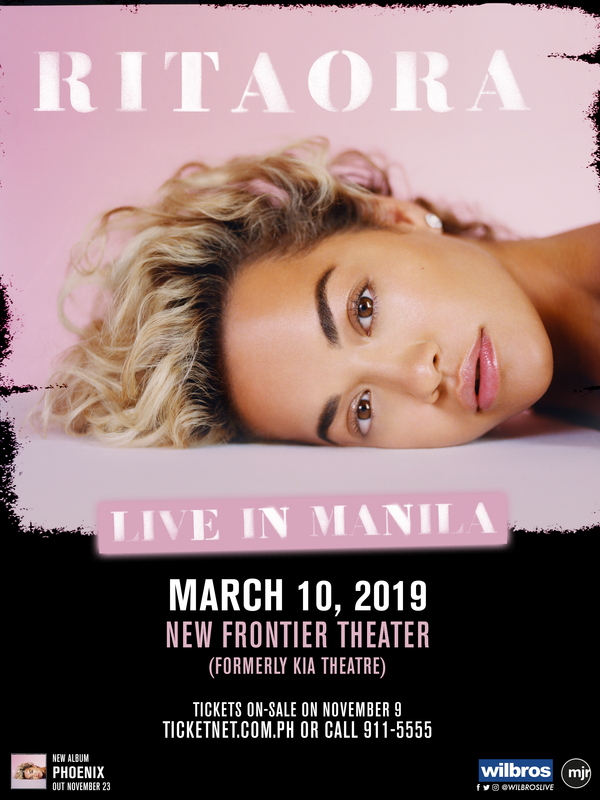 For the first time, British singer-songwriter, Rita Ora will be coming to Manila on March 10, 2019 at the New Frontier Theater (formerly KIA Theatre), as part of her upcoming World Tour 2019 that will include stops in Europe, Asia, and Australia. The global pop star is also due to release her second studio album, "Phoenix" out on November 23 via Atlantic Records, which includes the chart topping single "Let You Love Me." It has been a momentous year and a half for Rita – following a sold out European tour and an incredible summer playing to millions of fans with over 33 live dates, her latest five hit singles have amassed over 1.3 billion Spotify steams worldwide. Global hit, "Your Song," written by Ed Sheeran and Steve Mac has reached more than 352-million streams alone - it is also her biggest hit in Europe and was a Top 10 smash in the UK singles chart. Following on from this, she released a global Top 10 hit "Lonely Together"–a collaboration with Avicii. Her single "Anywhere" earnt a #2 spot in the UK. Further collaborations with Liam Payne for the the Fifty Shades Freed Soundtrack "For You" became her fourth Top 10 hit, as well as her girl-power anthem "Girls," which saw Rita team up with Cardi B, Bebe Rexha & Charli XCX to achieve yet another global success. Other hits by Rita include "I Will Never Let You Down" and "Body on Me" featuring Chris Brown. Presented by Wilbros Live, tickets to "Rita Ora – Live in Manila" go on-sale on Friday, November 9th via TicketNet.com.ph or call 911-5555. For more information, follow Wilbros Live on Facebook, Twitter, and Instagram. Any Rita Ora fans out there? Sound off in the comments section!